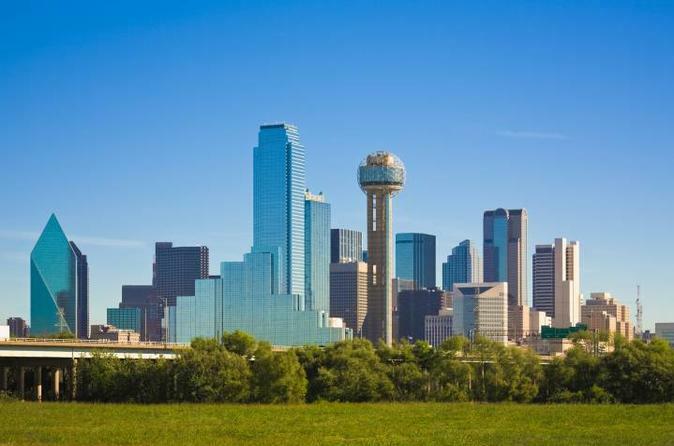 Presented completely in English and Spanish upon request, this city tour will take you to discover the most significant points of Dallas including the JFK assassination area in Dealey plaza and several of its distinctive districts and neighborhoods. Available pick ups at DFW, DAL, Downtown Hotels and residential. The Dallas City Tour begins by visiting one of the most important bronze sculptural set in the United States: Pioneer Plaza. This is a tribute to the long horn legacy of this great city represented in the famous "Cattle Drive." Later you will enjoy a tour of the central area of the city including a walk on Main Street where you can find the first Neiman Marcus store in the United States, as well as the famous sculpture "The Eye." Continue to discover the Dallas neighborhoods by visiting the historic West End, where historic buildings are blended with modern constructions preserving a look of old warehouses and brick cellars. In the West End you will have the opportunity to stop a few minutes at Dealey Plaza, where the assassination of President John F. Kennedy took place in 1963 .Finish your tour of the Downtown area at the modern Victory Park area and home to the sports and entertainment center, American Airlines Center. Your tour will also take you to visit the famous Arts District, one of the largest in the country, as well as the Klyde Warren Park, built over 8 motorway lanes linking the Downtown area with the Uptown area. Upon leaving Downtown, the tour will continue by McKinney Avenue, the main street of the vibrant uptown area, full of restaurants, bars and boutiques. Your tour in Uptown will also take you to the West Village Shopping Center as well as the stylish Turtle Creek neighborhood, also known as the "Beverly Hills" of Texas. Your panoramic view of the city will conclude with a short walk by Mockingbird Street and the South Methodist University (SMU) campus with its impressive buildings, frat houses, and museums such as the Meadows and the George W. Bush Presidential Library.